As the No. 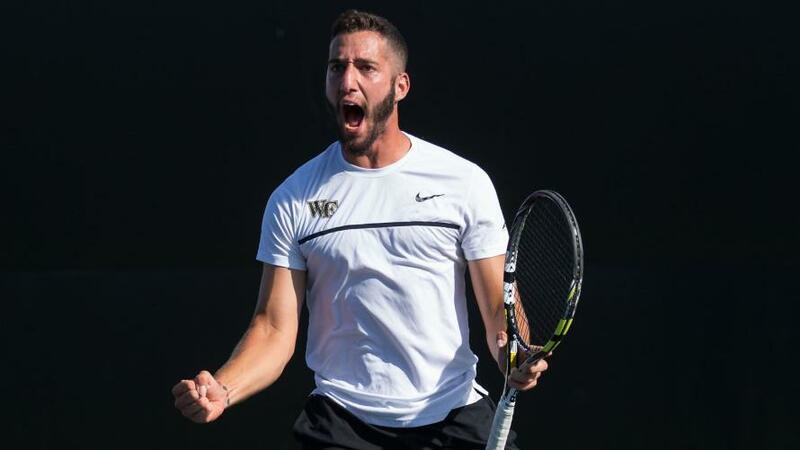 2 ranked team in the country, Wake Forest has a highly ranked singles player (Petros Chrysochos), can boast about another player in the top five (Skander Mansouri), and has the best ranked doubles team (Christian Seraphim and Skander Mansouri). With a recruiting class that is one of the best in the nation, Alan Gadjiev will be looking to prove himself, as he was ranked a mere No. 122. The success and ambition of our program isn’t unprecedented, and I’m glad that it is being recognized at a national level. However, the coaching staff that has been a critical part of this rise in the ranking does not always receive the credit it deserves. Head coach Tony Bresky has officially legitimized the Demon Deacons as a national power. First, he did this with the help of assistant head coach Jeremy Feldman and now he is doing this working with current assistant head coach Chris Eaton. Chris Eaton, a native to Great Britain, has a lot of experience both as a player and a coach. He has helped coach Henri Kontinen, John Peers and Jamie Murray and has played in the main draw of Wimbledon for four years in a row. Furthermore, he has represented his home country in the prestigious Davis cup. To better understand some of the factors behind the teams success, the Old Gold & Black sat down with assistant coach Chris Eaton. How many current men’s tennis athletes verbally committed to the school early in their recruiting process? In other words, what is considered early and how soon or late are you aware of the roster for next season? We tend to have some fairly early commitments, which would be around eight months before they would arrive in Winston Salem. However, with these commitments and the caliber of player that Wake Forest men’s tennis program look to recruit, we also have some late commitments and some players who have committed but who are also considering going to play professional tennis as opposed to college. There are some nervous times for us as coaches towards the start of each semester. When would you like to see junior tennis athletes begin visiting and researching colleges? Would you rather know of a potential athlete years ahead of time? If so, what factors do you consider in judging the potential of a 15-year-old as being different from another individual? For junior tennis players, I think it is important for them to start the researching process fairly early as you can gather so much information online now. With regards to visiting, as tennis invariably requires travel to compete at tournaments, players in their junior year could look to combine unofficial visits to schools with going to play tournaments in that specific area. While it is always difficult to judge the potential of a 15-year-old player, you can always look for physical and mental attributes on top of their results at the age group that they play. Usually, the top younger players will play in older age groups so we get a good idea of how they will be able to compete against bigger players and that will give us the indication needed that certain players have potential. How do college coaches work junior tennis tournaments? Do you go, or send staff or scouts to view the renown events? What about smaller tournaments in the U.S.? How do you focus on international players, or do they mostly reach out to you? Recruiting at tournaments is done by either the head or assistant coach, and we go to the top junior tournaments to get an idea and scout out who the next potential Deacs’ will be. These are used as talent scouting weeks, and also a good time to connect with coaches and find out which players will be looking at school and which may be thinking about turning pro. We go to all the major international and national junior tournaments in the U.S. and abroad. We also attend a few smaller events, depending on who is entered in each event. As for the international recruits, we get to see some of them at the Junior grand slams or other major junior events, but there is also a lot of research done on foreign national ranking systems and professional rankings to find out who has the potential to be great on our team. We then try to go and visit them to see them train or compete. Is it better to have a weaker result in competitive tournaments or will the higher placed finish in a less competitive field catch your attention more? Ideally, with where our program is and the goals we have for the program, we are looking for players with great results in high level, competitive tournaments. However, as a coaching staff, we have good knowledge of a lot of players and therefor can decipher the level of a player by who they play and who they beat or lose to. Did you sign Croatia native Borna Gojo expecting him to be an immediate contributor in singles or doubles? Borna is a tremendous talent and we anticipate him to be an immediate impact player for the Deacs in both singles and doubles this spring. His recent results indicate his continued progress and desire to improve and having been in consistent contact with him, I’m confident he will be a huge asset to the team both on and off the court.